Both flowers and leaves are very attractive. 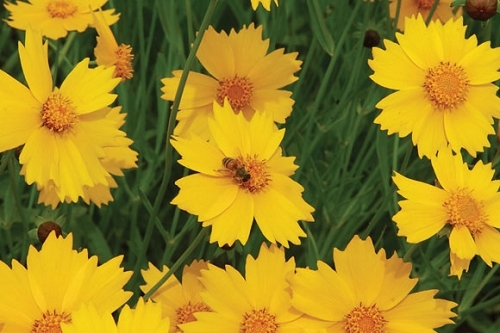 This species, along with other Coreopsis species, is great for attracting bees in the early- to mid-growing season. Many of the domestic coreopsis varieties are derived from this species. When you visit us in May or June, you can see how native plants can beautify the highways as lanceleaf coreopsis blooms for miles along highway 54. It is easy to grow from seed and makes a good nurse crop for prairie and glade restoration projects. This is a beautiful plant with beautiful flowers that bloom many weeks at the most beautiful time of year. Very hardy !! An individual plant will spread to a nice cluster in a few seasons. Needs deadheading, but other than that there is absolutely no maintenance required. Q: Do Coreopsis lanceolata and Coreopsis grandiflora hybridize by natural cross-pollination? If so, what kind of special considerations are necessary to save seed if you want them to stay true? A: It's not likely. The Flora of Missouri doesn't mention any hybridization, and we've never noticed it. However, there is a lot of variation within each species. You could have two lanceleaf coreopsis and one could have lots of hairs while the other is completely smooth. Q: Is the lanceleaf a perennial? A: Yes, it is a perennial. In a seeding project, it may diminish considerably after 6 to 8 years as other species mature and take over. This quality makes it a nice cover crop for early color.